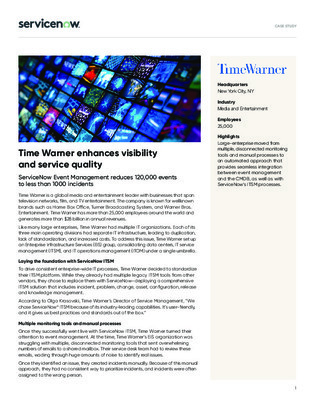 Time Warner Inc. is a global media and entertainment leader with businesses that span television networks, film and TV entertainment. They needed to move from multiple, disconnected monitoring tools and manual processes to an automated approach for seamless integration between event management and the CMDB. Read this case study to learn how they were able to overcome these challenges with an ITSM service.